Wednesday, June 13th, 2018 was a beautiful sunny summer day and an exciting tournament was in the making. 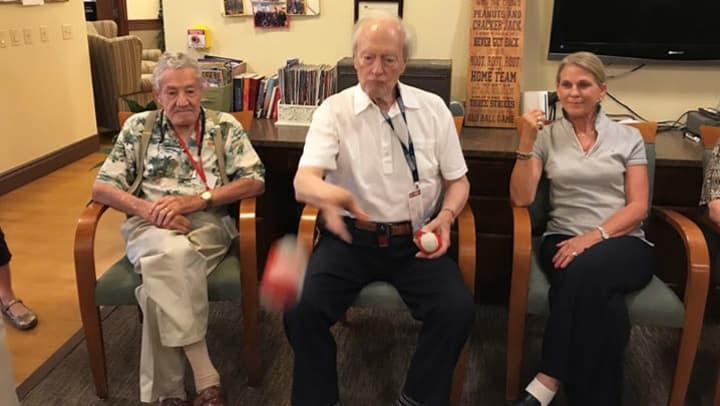 Clermont Park's Adult Day participants and team members traveled to Adult Day at Someren Glen and celebrated their fourth tournament by playing ball darts. The participants were split into two teams, mixed together from both communities. They chose team names - Dorothy and Nina. There was a lot of cheering, smiling, and concentration to through the ball well and score. The teams played two games with the first score with Dorothy at 1530 and Nina at 1740. The second game scores were Dorothy at 1590 and Nina at 1430. Christian Living Community's Adult Day tournaments have been a huge success - participants and team members join together for socializing, laughing, and having fun. A fabulous time was had by all!